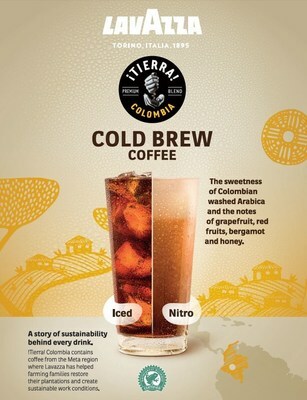 NEW YORK, U.S. — Lavazza launches new cold brew offering in the US, made from ¡TIERRA! Colombia, a unique blend characterized by a sweet and smooth taste and a rich body. The new venture combines Lavazza’s commitment to curating an elevated coffee drinking experience beyond the morning cup, by utilizing a new and sustainable blend. The blending of in-cup excellence and the design of ¡TIERRA! Colombia cold brew coffee lies at the heart of the new taste profile, specially made to be appreciated by coffee connoisseurs as well as those always on the lookout for new trending varieties. Lavazza’s cold brew provides a refreshing caffeine boost made with 100% washed Arabica coffee beans from Colombia. The blend serves as Lavazza’s introduction to the growing cold brew market and will be made available with equipment to all Lavazza-serving establishments to maintain its fresh and delicious taste. The blend will be available in traditional and nitro cold brew formats. The nitrogen-infused variety adds a rich, creamy taste and a long-lasting cascading effect. With notes of grapefruit, red fruits, bergamot and honey, the smooth aromatic profile provides characteristics that are more likely to be enjoyed without added sweeteners and dairy. The new blend is one of the first cold brews certified by the Rainforest Alliance, the international non-profit organization that works to conserve biodiversity and promote rights and welfare of workers, their families and communities. Made from Lavazza’s newest blend, ¡TIERRA! Colombia, the cold brew offering contains coffee from the Colombian Meta region, where Lavazza continues to help farming families restore their plantations and create sustainable work conditions. The ongoing ¡TIERRA! Project has helped over one hundred Colombian farming families rebuild coffee plantations and worked to improve healthcare, as well as bringing drinking water to plantations and villages. Lavazza ¡TIERRA! Colombia is now available for purchase by food service professionals with options to serve the blend through table top and freestanding machines. In addition to traditional iced and nitro cold brew options, ¡TIERRA! Colombia will also be available in standard whole bean and ground blends in all US restaurants and cafés where Lavazza is served.